Fast food in the U.S. has grown from a $6-billion-a-year industry in 1970 into a corporate juggernaut with a reported $200 billion in annual revenues in 2015. Especially because “meat,” dairy, and eggs are the main ingredients in fast food, the exponential increase in its consumption has engendered a wide range of negative social impacts—including rapidly rising rates of diet-related disease, worker exploitation, systemic animal abuse, and environmental degradation. The fast-food industry’s economic clout has not only enabled it to effect a radical shift in the country’s eating patterns (as well as those around the globe), but it has also fundamentally altered the very way that food is produced. The industry’s enormous purchasing power and demand for vast amounts of cheap animal products are among the principal driving forces behind factory farming, as well as the massive government subsidies for staple animal feed crops like corn and soy that sustain it. As a result of the industry’s excessive economic influence, gigantic multinational corporations like McDonald’s, Burger King, and KFC make huge profits selling fast food at artificially reduced prices. Meanwhile, obscured behind the veneer of fast-food companies’ slick multi-billion-dollar marketing campaigns are the true costs to public health, fast-food workers, animal welfare, and the environment. Blacks, Latinx, and other people of color most likely to live in areas which lack access to healthy foods suffer disproportionately from higher rates of diet-related disorders than whites—and fast food is one of the main causes of this deadly disparity. 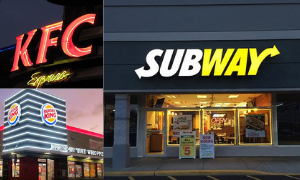 Residents of these areas typically have a plethora of fast-food restaurants to choose from within walking distance of their homes, but the nearest supermarket or grocery store may be miles away. Also, many low-income individuals do not have access to private transportation and must work two jobs just to make ends meet. Feeding their families fast food is therefore usually quicker, easier, and less expensive than shopping for and preparing home-cooked meals; however, reliance on fast food as a dietary staple (especially over long periods of time) causes poor health from inadequate nutrition. Started in 1948 by two brothers, McDonald’s is arguably the most well-known fast-food retailer and a prime example of the spread of Western-style fast-food chains to global markets. In 2018, it was the second largest fast-food retailer behind Subway with the top global market value of $126 billion  and can be found in 120 countries with more than 37,000 outlets worldwide. Unfortunately, the rise in fast-food consumption across the globe parallels the rise of diabetes and diet-related disorders, as well. According to the World Health Organization, the incidence of diabetes had risen from 108 million people in 1980 to 422 million people in 2014 and is projected to increase to 552 million by 2030. Workers: At any given time, there are at least 3.5 million fast-food workers in the U.S. They typically work for minimum wage without medical benefits or the right to unionize, and women endure regular sexual harassment and assault, so turnover is high. The Environment: According to a report by the Food and Agriculture Organization of the United Nations, the livestock sector represents “14.5 percent of all human-induced emissions” and “plays an important role in climate change” with “beef” and cow milk production accounting for the majority of emissions. Then there’s fast-food packaging, which comprises almost half of the litter found on U.S. streets. And, to prevent grease leakage, many fast-food companies coat their paper packaging with perfluoroalkyls, which are toxic compounds that harm the environment  and human health. It is clear fast-food corporations don’t care about anyone—not the workers, not the animals, not the environment, and of course not people’s health. It’s all about making a profit. We would like to tell people not to buy from these fast food giants, but we know that might not always be possible. When there is no choice, it is still possible to make a difference by purchasing a vegan option. *This article only refers to the United States, as “America” would include all of the Americas. © 2019 Food Empowerment Project | Food Empowerment Project is a registered non-profit, 501(c)(3) and all donations are tax deductible.